Parents often choose faith schools because of their clear values, but it is not necessarily clear what this term means or how far the provision in faith schools is distinctive. This chapter explores key concepts and argues that values and values education represent both a major strength in and a major challenge to faith schools. Because of their consistent ethos and agreed framework of values, faith schools are able to provide sound and authoritative moral guidance to children (‘primary values education’), helping them to understand right and wrong and to behave in line with the shared values of their community. However, if young people are to make the values they learn in faith schools truly their own (‘secondary values education’), they need to learn to question their assumptions, to engage in critical thinking, to develop their moral imaginations, to be open to change and to learn the techniques of critical reflection and rational debate. These things may not come quite so easily to faith schools because of their reliance on authority and a clear, pre-determined framework of values, but without them young people may never attain moral maturity. Teachers in faith schools need to reflect carefully on their approach to values education to make sure they are developing students’ full potential and leading them towards personal and moral autonomy. Beckett, F. (2003, October 14). Teaching tolerance. The Guardian. 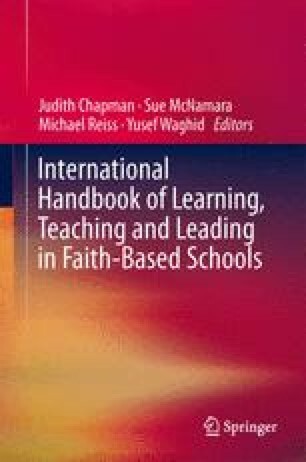 Available at http://www.theguardian.com/education/2003/oct/14/faithschools.schools. Accessed 13 Apr 2014.